The man who purchased more than 1,500 acres in central Vermont for a futuristic eco-uptopia has decided to abandon his plan and sell his land. What happened, and what's next? And now that their efforts have paid off, what happens next? Editor’s note: As always, we recommend listening to the episode! If you go to the Joseph Smith Birthplace Memorial, in South Royalton, something hits you as soon as you step out of your car. It’s barely loud enough to register at first. But then it’s all you can hear: these angelic voices. You realize there’s a network of speakers hidden in the trees. And this beautiful sound is just wafting through the air as you walk around. Joseph Smith was the founder of the Mormon religion, and he was born right here in Vermont. There’s a giant granite obelisk at this memorial; people come here by the thousands every year to pray or meditate or just check out the scene. Brave Little State came here with this month’s question-asker, Jillian Conner. 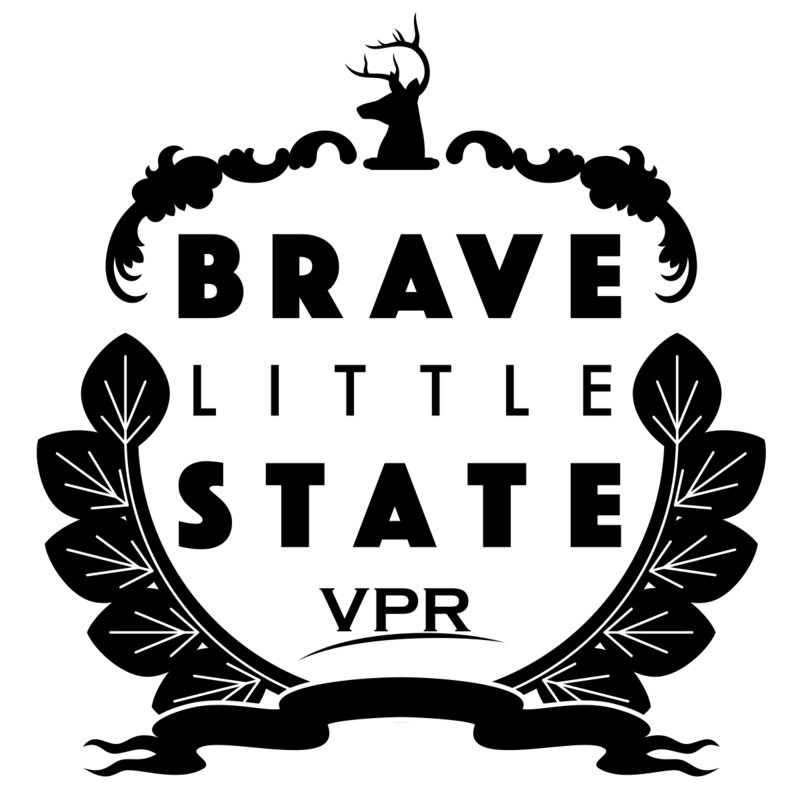 'Brave Little State' is VPR's people-powered podcast. We can’t help but ask about the choir music emanating from the trees, and it turns out it is not from Elder Hobbs’ playlist. It’s clear they’re trying to curate an experience here at the memorial. And this place had a profound impact on a guy named David Hall. Hall lives in Utah now. But he grew up in upstate New York and came here as a kid with his Mormon family. And he kind of imprinted on the place. Hall began buying up parcels in four small towns surrounding Smith’s birthplace: Tunbridge, Royalton, Sharon and Strafford. And the thing that really got people’s attention was that, eventually, Hall wanted 20,000 people to live there, on 5,000 acres. That’s what this episode was going to be about. How is a developer from Utah going to remake central Vermont into an ecologically sustainable utopia? And then, just when we finished writing the script, David Hall dropped a little bit of a bombshell on us: He announced that he’s decided to sell all the land he’s bought up. The local opposition over the past two years has been a little fiercer than he anticipated. “Those who are opposing my dream did a really good job, so I tip my hat to them,” he told us. So that’s it. David Hall is done with Vermont. But, the story of NewVistas isn’t over yet. It turned out that Jillian Conner had an agenda when she asked her question. “I have to be honest. I partially know the answer to my question. The reason I asked it was to sort of bring awareness to the issue,” she said. The opposition to Hall’s plan had been swift and intense. By the time Jillian moved to Tunbridge, residents of the four towns had rallied. They’d held non-binding Town Meeting votes. Many had vowed not to sell their land to David Hall. And they’d formed an opposition group called the Alliance for Vermont Communities — all to send the the message: No NewVistas. This month's question-asker, Jillian Conner, became aware of David Hall's controversial NewVistas plan just before she and her partner bought land in Tunbridge. Jillian was worried about the Mormon connection — even though David Hall had said that the NewVistas communities wouldn’t have any religious affiliation. We want to give props to Jillian because it is not easy to admit that you have views that you yourself disapprove of. But that’s what’s so fascinating about NewVistas. Whether it was the developer or the nature of his plan or the sheer scale of change this would have brought to central Vermont if it actually happened, this topic really got people going. And it gave us a lot to cover. If you live in central Vermont, or follow the news from this part of the state, NewVistas has probably been on your radar for a while. But in case you’re not familiar, here’s a bit more background. Back in 2016, John Echeverria, an attorney and a professor at Vermont Law School, gave a presentation about Hall and the NewVistas Foundation at a meeting of the Strafford Conservation Commission. His 44-minute talk is on YouTube — and as far as Hall’s development plan went, it answered the question “What’s the deal with New Vistas?” pretty well. David Hall built his career and fortune on something that his dad helped invent: the synthetic diamond. It has many uses, including drilling for oil and gas. Hall built his career on something that his dad helped invent: the synthetic diamond. It’s used for all sorts of things now, including drilling for oil and gas. Hall ran a business that focused on this use: developing and selling drilling technology. Now for the what. What was David Hall actually planning for Vermont? “The cornerstone of the building project is the community,” Echeverria said. He pulled up a slide of a city layout, shaped like a diamond. This is the community Hall envisioned for central Vermont, where up to 20,000 people would live. “That would be a density of development that’s about 300 times the density of Strafford,” Echeverria said. 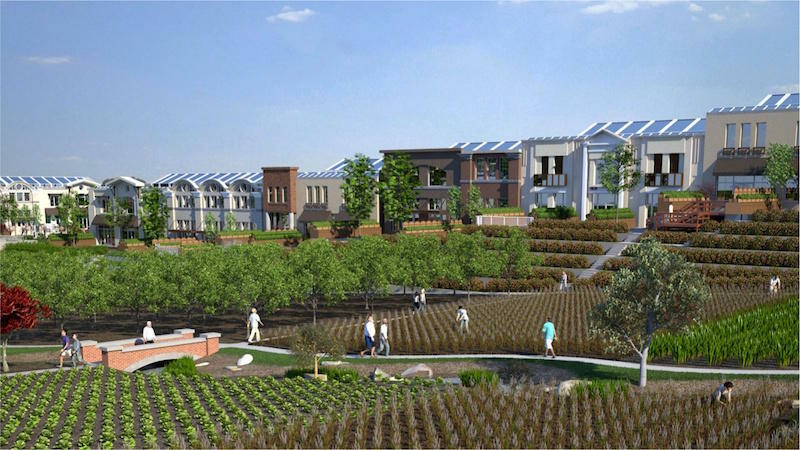 The design of a NewVistas community calls for compact living spaces and local energy and agriculture, and a population density roughly 300 times that of the town of Strafford. The design is super specific, with different-sized units all building up to a larger whole. Theoretically, you’d build one, and then another, and then another. John Echeverria is on the board of the Alliance for Vermont Communities, that group we mentioned that lead the resistance to NewVistas. But you can’t tell by the way he made this presentation that he’s opposed to Hall’s plan. David Hall was quite willing to communicate with Brave Little State. He went into a studio in Utah, where he lives, to talk to us — again, before he changed his mind about Vermont. To really wrap your head around what Hall was trying to do with NewVistas, you have to understand the genesis of the project. It came from documents from the 1830s. “The documents have a front and a back, and if you take all of the phrases, and triangulate them with each other, you can reduce to practice details like the exact chair size, which happens to be 24 inches square,” Hall says. The documents are called the Plat of Zion. They were created by Joseph Smith, the founder of Mormonism, whose birthplace had such an influence on David Hall. These documents had an influence on Hall, too — in fact, they’re kind of an obsession for him. The point here is that Hall wants his NewVistas community to be an absolute replica of the Plat of Zion. Because he thinks it’s the key to humanity’s future. “It’s really a world treasure from my point of view for us to figure out how to use it to create truly green communities for the future,” he says. And that brings us to a complicated paradox that underpins the whole NewVistas story. And that paradox is that David Hall’s vision in some ways has nothing to do with Mormonism. And in other ways, it has everything to do with Mormonism. The part of NewVistas that does have to do with religion, obviously, is its connection with the Plat of Zion. “The prophet is going to dictate what the city is going to look like, how big the lots are going to be, how many streets there are going to be, how large should the city be,” says Benjamin Park, an assistant professor of American religious history at Sam Houston State University in Huntsville, Texas. Park says Smith came up with the Plat when he was trying to start a Mormon community from scratch, in Missouri. But the thing is, even Joseph Smith doesn’t get true credit for the Plat of Zion. According to Mormon theology, Smith was a prophet, with a direct line to the voice of God. And it’s God who transmitted this whole Plat of Zion concept to Joseph Smith, sort of like a divine urban planning blueprint. 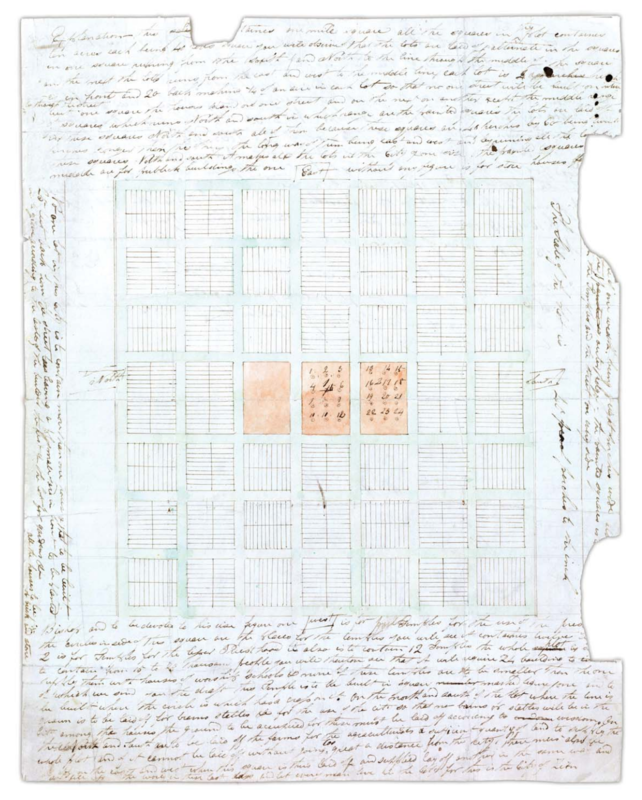 A detail from Joseph Smith's 1830s Plat of Zion. The documents are the source of the NewVistas concept & specifications. And Smith’s design for the Plat of Zion isn’t confined to building specifications. It calls for a new kind of governance structure, as well. Benjamin Park says there are no civic buildings in Smith’s Plat. Nothing at all, actually, that’s set aside for democratic institutions. So, David Hall has modeled NewVistas after a city of God. But, here’s where the Mormon connection begins to dissolve: David Hall says his concept has nothing to with Mormonism at all. He says this whole enterprise is about a global model for coexisting with the earth. And that that means it needs to welcome of people of any faith — or even no faith at all. “Otherwise, how does a Muslim come in? Or how does, you know, an agnostic come in, and stuff like that,” Hall says. That humans are meant to live as Joseph Smith envisioned is a matter of providence and faith for David Hall. And it definitely takes a lot of faith to believe in the NewVistas concept. “OK, here’s an analogy that may not make sense to you but it makes sense to me, alright? We have 24 chromosomes in our system that makes up our biology, right?" Hall said. And that brings us to yet another paradox to untangle: Mormonism may be the religion that gave birth to the whole Plat of Zion concept, but Benjamin Park says even Mormons don’t think the Plat of Zion should be taken literally. 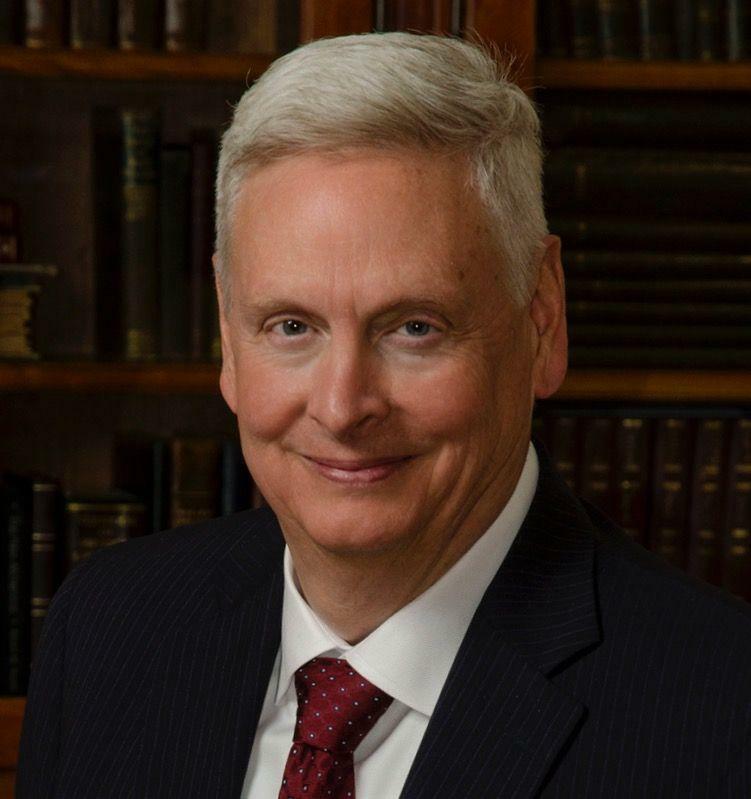 The church has publicly disavowed any connection with David Hall and his NewVistas plans. We and Jillian actually broached the subject with Elder Hobbs when we were at the Joseph Smith Memorial. It’s clear that David Hall is on his own wavelength. And when it came to his plans for Vermont, he figured Strafford, Sharon, Royalton and Tunbridge could be just the beginning. Before he changed his mind about Vermont, he told us that Vermont could have 20 million people in 20 NewVistas communities. He also said he was in no rush. The strict law Hall referred to is Act 250, which is Vermont’s land use and development law. It’s quite rigorous. But the people who live in these four towns weren’t going to rely on it, or leave anything to future generations. They took matters into their own hands — and they were the reason Hall changed his mind. In early June, the Alliance for Vermont Communities held a big fundraiser: a semi-competitive bike ride through Tunbridge and Strafford. The ride started at the Tunbridge World's Fair grounds. Alex Buskey, the outreach manager for the Alliance, explained the origin of the ride’s name: The Ranger. “A ranger is somebody that protects a specific plot of land. 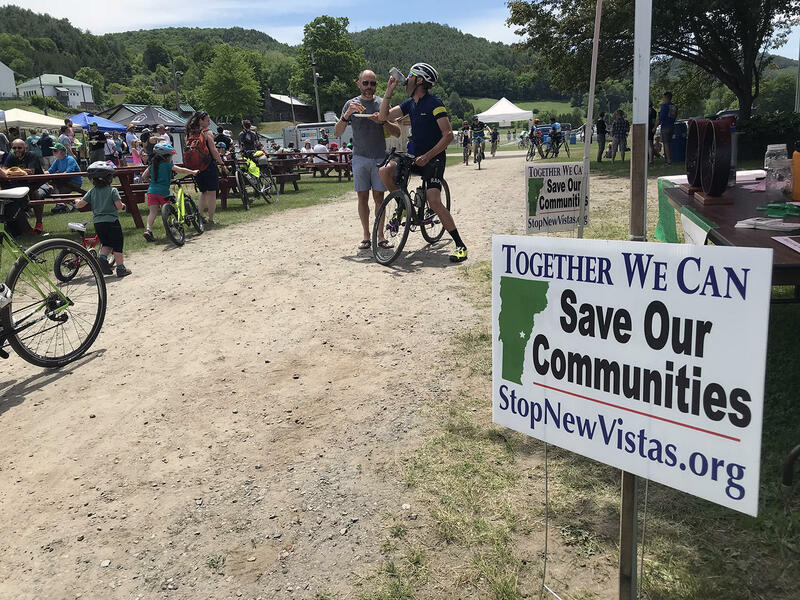 I want everyone here to leave as a ranger, not just for this place, but for everywhere you go ride, thinking about what it means to you, what it means to the people that live there,” Buskey said to a crowd of more than 200 cyclists. More than 200 riders turned out in early June for a fundraiser bike ride through Tunbridge and Strafford put on by the Alliance for Vermont Communities. Some people were just here to ride their bikes. But we talked to enough people who were clued in to the cause to get a sense of what motivated this opposition. We caught up with Malachi Brennan at around mile 20 of the ride, on Monarch Hill Road — a steep dirt road that passes by hill farms. Brennan is a student at Vermont Law School, and said he’d done some volunteering for the Alliance. “I’m just very wary of the guy and I wish he would appreciate the democratic spirit here, and listen to what the townspeople have to say,” he said. Suspicion of David Hall, and a desire for local control. Peter Anderson of the Sharon Planning Commission was volunteering at the event. He had a strong dose of the former. “[Hall] has clearly predicated his wealth on mineral extraction, and that would be something that presumably they would be interested in doing,” Anderson said. You might remember, from John Echeverria’s presentation, that the design of a NewVistas community has a section set aside for drilling. Anderson was concerned that that was a primary objective for David Hall. “I don’t know really what’s under there. And I don’t know whether he does. But that’s what his business has been," Anderson said. The most rattled person we met was probably Jane Huppee, of Tunbridge. Jane is a seventh-generation Vermonter and the treasurer of the Alliance. We left the bike ride to drive up to her house on Button Hill Road, where David Hall has purchased several parcels. We sat on Huppee’s front deck, which has spectacular western views. And she talked about how unsettled she's been by the changes on her road. Huppee talked about a sign that one of her new neighbors had put up at the head of their driveway. She had a photo of it on her phone. It’s one of those faux-official warning signs that you can buy. It says, “Due to an increase in the price of ammo, there will be no warning shot.” You could read it as a joke, but Jane Huppee didn’t. When asked whether she’d tried to introduce herself to the new neighbors, Huppee said she hadn’t yet. Back at the Tunbridge World’s Fair grounds, riders were returning to a big party, and the neighbors who did know one another were enjoying craft beer and cow pie bingo. 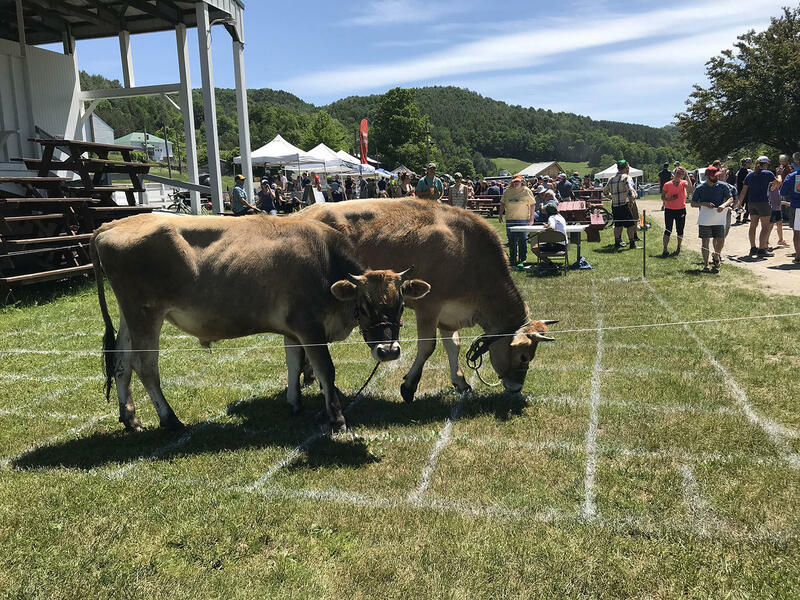 Cow pie bingo at a post-ride community celebration at the Tunbridge World's Fair grounds. "[People] are in favor of saving our rural communities ... with similar values and similar aspects of rural living," said Alliance board member Jane Huppee. Out in the parking lot, Michael Sacca, the president of the Alliance for Vermont Communities, said he too was suspicious of Hall’s plans. Sacca made clear that the Alliance isn’t ideologically opposed to growth. “Alliance for Vermont Communities, we are not against development. We are for appropriate-sized development,” he said. “Nowhere in our town plans, the regional plan or state guidelines does it say anything about building outside of the village settlements in this way." The Alliance managed to work on two fronts: saying no to David Hall, while simultaneously building relationships across the four towns that hadn’t been there before. “If there was one good thing that came of NewVistas being here,” said organizer Alex Buskey, “it was the cohesion among the four towns and the people that live here, all having one common goal that's really strong. So it brings out the most passionate people." And those passionate people got results. In March of this year, John Echeverria, the guy whose presentation we heard earlier, testified in front of the Vermont House Committee on Natural Resources, Fish and Wildlife. Echeverria said Hall had broken Vermont and Utah nonprofit laws when he transferred his land from his nonprofit NewVistas Foundation to a for-profit LLC. In April, the Vermont House passed a resolution opposing NewVistas, saying the development would “undermine the historic character of these towns” and “degrade the area’s natural resources.” In early June, the Alliance announced that, with help from the Vermont Land Trust, it had purchased a 218-acre parcel just east of the Joseph Smith birthplace. And then, just a few weeks later, the pièce de résistance: The National Trust for Historic Preservation put Royalton, Sharon, Strafford and Tunbridge on “watch status” in its 2018 list of “America’s Most Endangered Historic Places.” The Alliance had campaigned for the designation. The day the list came out, David Hall decided to pull the plug on his plans for Vermont. We talked to him the next morning. David Hall isn’t the first person to watch his dreams for a Plat of Zion community get crushed. Joseph Smith himself actually tried to establish his own utopian community back in the 1830s, on a piece of land in Missouri. “He declares that this place is going to be Zion, or the center place of God’s restored kingdom,” says Benjamin Park, the religious history professor at Sam Houston State University. It did not work out that way. The locals drove Smith out. And he didn’t have any better luck in the other places he tried to establish his Plat of Zion. “Joseph Smith himself kind of moves away from that society because it fails quite spectacularly over the next couple years, both for internal and external reasons,” Park says. Smith never really found a peaceful spot to land. In 1844, while he was being held in a jail in Illinois, an angry mob stormed the prison and killed him. “It’s surprising how even the concept of somebody’s idea can arouse so much, you know, opposition,” David Hall says. Hall doesn’t have to worry about a lynch mob, of course. And he doesn’t seem to hold a grudge with the opposition that ran him out of town in Vermont. “There’s some people that have, you know, a firm dream of keeping things exactly like they are, and that is their dream, right? So it’s just a conflict of long-term dreams,” he says. Hall says this isn’t the death of his NewVistas plan by any stretch. It’s just that Vermont won’t get to be a part of it. We got back in touch with our question-asker Jillian when news broke that Hall was abandoning his plans. Jillian said she could see where Hall is coming from when he says Vermont’s trajectory isn’t sustainable. Green technologies like electric cars are getting us closer to sustainability, Jillian says, but there’s still a long way to go. “I feel like it's funny because [Hall’s] development plans were really counting on the advancement of a lot of technology. And … in that same vein, I think the success of rural Vermont is also sort of waiting on similar technology,” she said. But not everyone is as sanguine as Jillian is. “Well, look, I always think it’s tragic when an opportunity to develop and create jobs and create vitality and prosperity in a community goes away,” says Joan Goldstein, the commissioner of the Department of Economic Development within Vermont’s Agency of Commerce and Community Development. Goldstein also sat on the Royalton Selectboard until 2017, when she decided not to run for re-election. She said she had trouble with her community’s response to Hall’s ideas. And Goldstein says she’s worried about future developers, and how they’ll feel about bringing their ideas and money to Vermont. Bruhn, the executive director of the Preservation Trust of Vermont, says intolerance had nothing to do with it. “It had to do with somebody coming into the state without having a discussion with people and imposing a development idea or scheme on Vermont before there was an opportunity to have a dialogue,” he said. The Preservation Trust and several other groups — the Vermont Natural Resources Council, the Upper Valley Land Trust, the Vermont Land Trust — worked with the Alliance for Vermont Communities to try to stop David Hall. “[It’s] sort of like the dog that actually got the car,” he joked. Now, instead of opposing David Hall, at least some of these groups might end up giving him money, so they can buy back his land. Hall’s got over 1,500 acres to sell, for about $7 million. When Bruhn spoke with Brave Little State, he hadn’t even had a chance to meet with all the other groups yet. But he said he had had some very cordial conversations with David Hall about a potential sale. “You know, he’s very interested in seeing as much of the property conserved as possible,” Bruhn said. There’s also been talk of subdividing — to conserve the bulk of the acreage, but keep the homes on the housing market. But Bruhn said it’s still very early days. David Hall also told us that he’s interested in conservation, too – though he added that he’s not in a rush, and that the market will determine where things go. So until he sells, if he does ultimately sell, Hall will remain a major landowner in these four towns — and a landlord, and a taxpayer. But he seems to have made up his mind that he won’t be a developer. Disclosure: NOFA-Vermont, one of the groups at the Alliance for Vermont Communities' Ranger fundraiser, is a sponsor of Brave Little State. 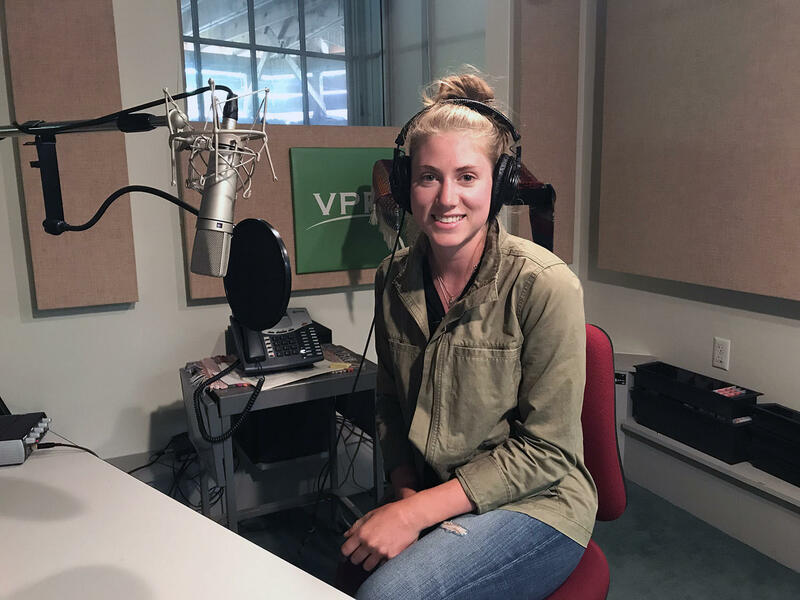 Brave Little State is a production of Vermont Public Radio, and is made possible by the VPR Innovation Fund. Editing this month by Lynne McCrea and Henry Epp. Our theme music is by Ty Gibbons, and we have engineering support from Chris Albertine. Special thanks to John Gregg and Rob Wolfe at the Valley News, BYU Radio in Provo, Utah, Meg Malone, Steve Zind and Bob Kinzel.